Josef “Jo” Dawson Mayer, pharmacist, historian, and collector of pharmaceutical antiques, was born in the industrial city of Mannheim, Germany on 21 June 1870, the younger of two sons born to Henry and Charlotte Mayer. In 1888, at the age of eighteen he began his pharmaceutical education as an apprentice in a succession of pharmacies in Germany, Alsace, and Switzerland. He continued his education at the University of Freiburg where he studied pharmacy and chemistry. From 1897 to 1898 he studied at Heidelberg University where he received a degree in metallurgy. During the mid-19th century with the beginnings of the modern scientific pharmaceutical industry, pharmacists became increasingly interested in the history of their profession. As early as 1883, pharmaceutical historian Hermann Peters proposed the establishment of a German pharmacy museum in Nuremberg. It was in this atmosphere that Mayer learned the pharmaceutical trade and developed his lifelong passion for the history of pharmacy. According to his biographer, Mayer began to assemble his pharmaceutical collection during his first apprenticeship. In 1926 he would become one of the founding members of the Gesellschaft für Geschichte der Pharmazie (the Society for the History of Pharmacy). 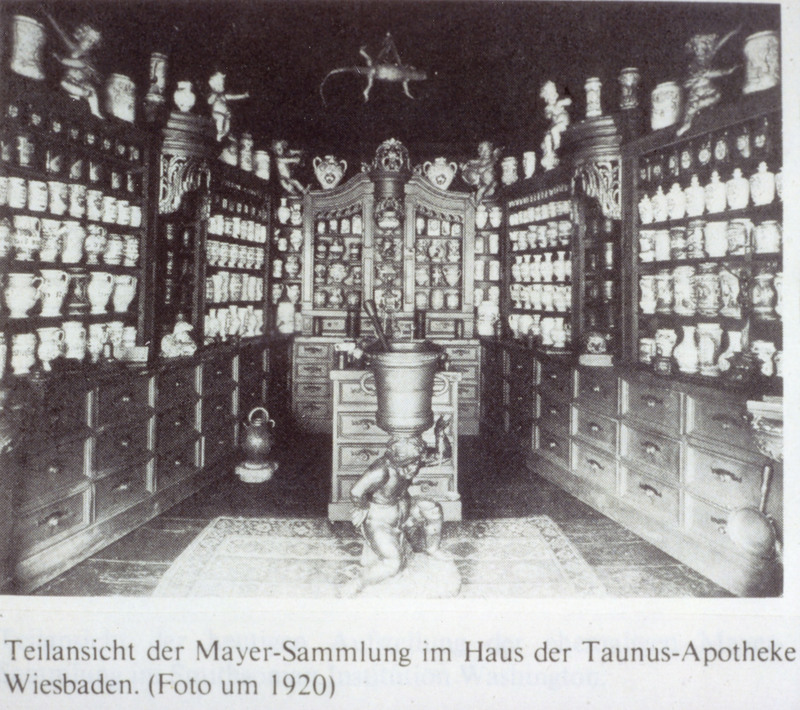 In 1898 Mayer purchased the Taunus Apothecary in Wiesbaden, Germany, a cosmopolitan spa town that attracted wealthy tourists from all over Europe. There he dispensed medicines, including homeopathic remedies and cosmetics that he formulated himself. On the second floor above his shop he created a “museum” to house his growing collection. The collection was known to leading historians of pharmacy in Germany and the United States, and it was considered to be one of the great pharmaceutical assemblages of the day. The upstairs of the apothecary, among old mortars and drug containers, became a gathering place where interested pharmacists could discuss the history of their profession. Mayer was considered by his peers to be a connoisseur and an astute collector. He was acquainted with many of the prominent historians of pharmacy of his time including historian and author of “Geschichte der Pharmazie, Hermann Schelenz” (1848-1922). In the 1920s and 1930s Mayer exchanged letters with American pharmaceutical historian Edward Kremers (1865-1941), sending him photographs of the collection and inviting him to visit it in Wiesbaden. Mayer exhibited the collection publically at the Handcraft and Trade Show in Wiesbaden in 1909 and at the International Hygiene Exposition in Dresden in 1911. Additional exposure came in 1930 from the pen of pharmacist Fritz Ferchl who published five articles in the journal German Pharmaceutical News featuring Mayer’s collection and praising him for his insight and connoisseurship. Mayer’s collection of more than fourteen-hundred objects is an eclectic array of artifacts spanning five-hundred years of pharmaceutical history in central and western Europe. He collected apothecary jars, mortars, old medical and pharmaceutical texts, distillation equipment, and cabinets to recreate a working environment of an “old-fashioned” apothecary. Still, Mayer’s collecting habits remain a mystery. We don’t know how Mayer acquired his treasures or if he maintained a collecting philosophy, though a few hints gleaned from correspondence between George Urdang and George Griffenhagen that Mayer found pieces of his collection in several European cities. It appears that the majority of the collection came from apothecaries close to where Mayer studied and lived in and around the Rhine River Valley, an established Roman trade route from the 1st century. Goods from across Europe and beyond found their way up and down the Rhine. Thus it was not uncommon to find artifacts from across the European continent scattered throughout the valley. Mayer’s collecting so clearly associated with his chosen profession, can be seen as a direct connection to his professional past. His collecting style can be seen from several perspectives. For instance, as a systematic collector he gathered ceramic drug jars spanning five centuries demonstrating similarities and variations in form and materials. 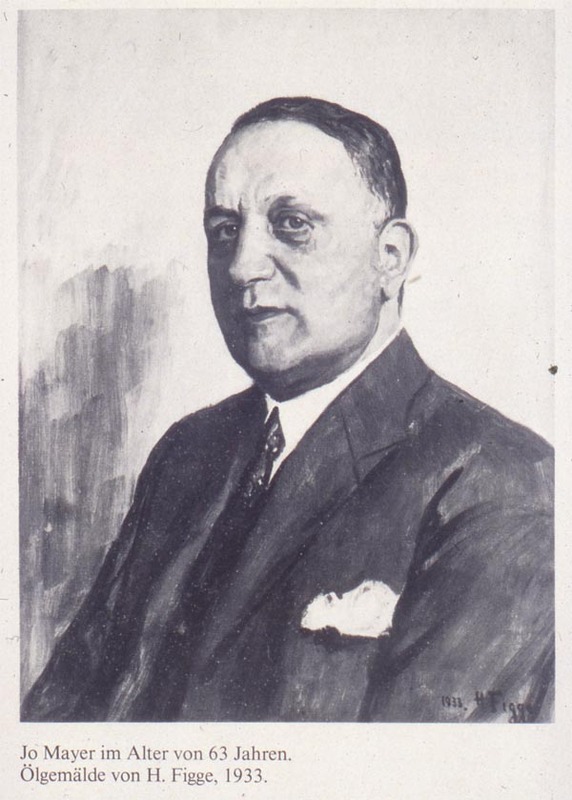 In 1933, like many German Jews, Mayer was forced by the Nazi regime to relinquish his business. Years earlier in letters to Edward Kremers, Mayer expressed his desire to visit his brother Alfred Henry Albert Mayer, a physician who had immigrated to Baltimore, Maryland. Sadly, due to ill health he never made the journey to America. Instead he remained in Germany with his wife and young daughter. In April 1940, on his way to visit a sick friend, Mayer was approached by the Gestapo and ordered to turn himself in to Nazi authorities the following morning. That evening rather than be subjected to deportation, Mayer swallowed poison. He died in a hospital never regaining consciousness.